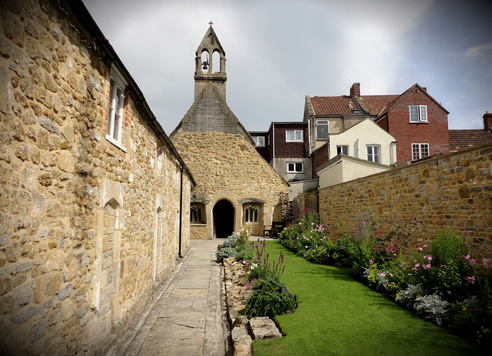 St Margaret’s Chapel, the Magdalene Almshouses and the garden are situated in a small, secluded site in a conservation area off Magdalene Street, Glastonbury. This group of buildings dates back to around the 11th Century, when Glastonbury was a major pilgrimage destination and built as a hospital for men with a Chapel (all paid for by Queen Margaret of Scotland). Two rows of Men’s Almshouses replaced the Hospital in the 16th Century, but one row was demolished in the 1960s – its foundations are under the garden. The site is now managed by the Mary & Margaret Charity which completed a large refurbishment and repair programme in 2012, including a new stone courtyard wall and disabled access WC, and a new West garden. The end Almshouse includes a simple iconography display and in the summer an iconographer can often be seen at work here. One Almshouse is also open to visitors to get a sense of life in the 16th century. 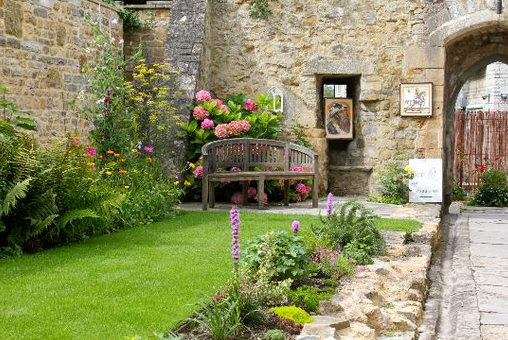 The gardens are tended beautifully, and are lovely to sit in. From the garden beyond the West gable you can appreciate the scale of original 12th century hospital.